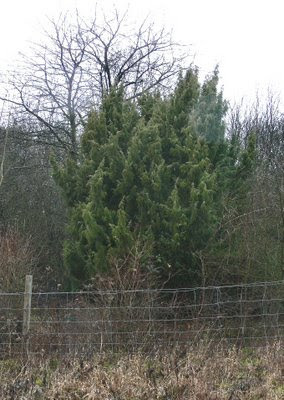 Juniper (Juniperus communis) is one of the three conifers native to the British Isles and there was a time in the not so recent past, or so we are told, when it formed a significant component of chalk scrub along the North Downs. Indeed in Clapham, Tutin and Warburg's Flora published in the fifties, Juniper is described as "often dominant in scrub on chalk and limestone". However, a Plantlife report published in 2004 suggested that on the whole of the North Downs it was in terminal decline with only 100 plants left. Now, the only place near here where I have seen good numbers of this species is Hackhurst Downs above Gomshall although I have not been there for a few years. This demise is not just local, nationwide the same report was suggesting a 50% or greater loss over the past thirty years or so. The reasons for this decline appear as with so many others, complex and difficult to define, certainly many populations do not appear to be regenerating from seed possibly as a result of climate change. The "good" news is that if you want to see one there are still a few plants around Banstead. On Banstead Downs there are a grand total of six quite large plants scattered across the golf course side of the Downs, mostly in fairly tall scrub. They all appear fairly healthy and still appear to be growing well. On Park Downs the situation is rather sad, there is just a single, albeit large, plant slap in the middle of the site, see photo taken in the murk today. It is an elegant plant about 15 feet high with slightly drooping foliage. Certainly the situation on Park Downs appears terminal, Juniper is dioecious, i.e. has separate male and female plants and hence it takes two to produce seed!! Even on Banstead Downs although there are both male and female plants there is little suitable habitat for seedlings to flourish, not that mature fruit have been observed there regularly. Luckily the final demise of the plant on Park Downs may be far off, Junipers live over 100 years and so the graceful plant on Park Downs may continue to give pleasure for quite a few years. Perhaps we should christen it George after the last Pinta Island Tortoise in the Galapagos. John, there is still a good number (tens) of Juniper on Walton Downs. Given the longevity of the species, would there be a valid argument for planting a complementary specimen nearby? Following your post, I had a look for Junipers locally - and was pleased to find a good few on the golf course. Thanks for the plug. I have posted a comment on your blog. With regard to planting other specimens it has been done unofficially using cuttings taken from plants on Banstead Downs, all were lost, presumably eaten by rabbits. That may be followed up officially, being a SSSI it would need the approval of Natural England.